they told you they weren’t going to do anything. That’s the difference between Democrats and Republicans. Democrats tolerate dissent and opposing ideas, unlike Republicans who insist you are an oath swearing lockstep marching buffoon. That is why a lot of thinking Republicans are leaving the party. something about this they couldn’t. Yes you are correct, The obstructionist Republican Senators are filibustering more legislation then any Congress ever, as I pointed out in one of the stories yesterday. Funny how much they bitched and whined when Democrats tried to stop people like Harriet Miers from being nominated to the Supreme Court. So it’s OK when they do it but not OK when someone else does it. Isn’t that just like those whiny little idiots. I am not making any money on the war, I would be here even if there was no war. 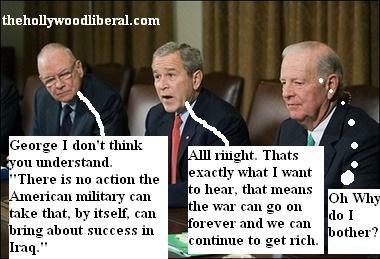 Making (very little) money fighting against the war is hardly the same thing. See that’s the problem with you Republican trolls, no matter how many times I point out the obvious you never seem to get it, and keep posting the same BS that I already proved wrong time and time again, then you wonder why I delete you absolutely retarded comments. Actually I am happy to post any comments from anyone who has an intelligent opinion and not just a lot of profanity and buzz slogans you heard in church or from Bill O’reilly. Oh so the people who post comments on both sides of the aisle on here are uninformed but you are the only genius who has the mental capacity to actually know what you are talking about? want them to know the truth. Yep, every now and then you may see a really stupid comment on this site, those all come from the troll who spends all day trying to figure out ways around my spam filters. His name is Bill, or is it Proud Conservative, or is it Kill the Islamofacists, its all the same guy. Have a great dream day. This Friday, August 31, marks the three year anniversary of the day I along with over 1500 other people were arrested at the 2004 Republican National Convention. Here is an email from the RNC Defense site commerating the event. It has sure been a crazy three years since being arrested, and although it sure sucked bad, it taught me a lot, hardened my resolve, and introduced me to some great friends. I have continued to do the Manhattan CM every single month, as well as joining the Brooklyn CM’s. This has proven to be very surreal – one month the police are willing to chase you into oncoming traffic over a horn or light, the next month they are friendly helpful human beings. I would like to thank all of the reporters, legal observers, lawyers, film people, bloggers, activists, organizers, and just kind folks who have kept this in the public eye, and made the experience as good as it could be. Thanks to the guy on the prison bus who gave me the chili patch. Months after the arrests, I remember standing in St. Marks church after a CM ride while Rev Billy “exorcised” the evil spirits from a group of arrestees. The place was packed, and everyone there cheered and showed us love. It was such a warm positive vibe, while outside the police sat huddled in their cold vans. I knew that we had already won, and that greater victories lay ahead. In my case all charges were dropped the day after it made the paper that police had illegally edited video in a case almost identical to mine. I got my bike back, as well as my friends. Of the people I was arrested with, no one had worse then an ACD, and some were dismissed completely. I’ve gone through my 50-H, and look forward to finishing the next step in this process. If anyone still reads these, please post something about the experience, what you’ve done since, where your case stands, whatever. PS I still remember the feeling of getting out of The Tombs, and finally out of those damn zip-cuffs, hand-cuffs and daisy chains. The feeling of freedom was something that I had never appreciated so much in all of my life. My next meal was the best I had ever eaten. When other aspects of my life get bad, I’m always concious of how good it feels to at least have the freedom to move and be free. I read your story from this morning“Time For Us to All Take Action” and emailed Dianne Feinstein, here is her response. Thank you for your letter concerning impeachment proceedings against Vice President Richard Cheney. I appreciate the time you took to write and welcome the opportunity to respond. In our most recent elections, the American people expressed clear disapproval with the path this country was on. They are tired of partisan politics and of an Administration that pays little heed to the wishes of the American people. They want-and deserve-a Congress that holds the Administration accountable and fulfills its Constitutional responsibility to check and balance the Executive branch. I share this sentiment and am determined to work hard and across party lines in the United States Senate to promote issues that are of real concern to most Americans, including the situation in Iraq and Afghanistan, homeland security, global warming, and lobbying and election reform. I have been deeply disappointed by many of this Administration’s actions and have been outspoken in those instances. Nevertheless, given the challenges our country faces I believe that we need to focus on constructive and cooperative steps that would lead us in the right direction. Again, thank you for your letter. If you have any further questions or comments, please contact my office in Washington, D.C. at (202) 224-3841. Best regards. LMZ, thanks for the email, thats about what I expected from Feinstein. Here is my response to her. I am afraid I am going to have to seriously disagree with you on your assessment of the Cheney Impeachment situation. You state that impeachment proceeding would only divide the country even further. I don’t think so, over 70% of the American people favor The US leaving Iraq, yet Bush refuses to do so. You have the people behind you. Let’s not forget that this war was based on lies that members of Congress fell for when the blogoshere knew quite well about the lies well in advance, as did the 6 Million people worldwide who marched against the war on February 15, 2003. If you read my article from today then you now know what is currently going on. Impeachment may be your only chance, and our only chance. Then DO SOMETHING about it. That is your job. You have the power, use it. The American People demand nothing less. In London, the British government summoned the Iranian ambassador to the Foreign Office: “He was left in no doubt that we want them back,” Britain’s Foreign Secretary Margaret Beckett said after the meeting. The U.S. Navy, which operates off the Iraqi coast along with British forces, said the British sailors appeared unharmed and that Iran’s Revolutionary Guard naval forces were responsible. Britain’s Defense Ministry said the British Navy personnel were “engaged in routine boarding operations of merchant shipping in Iraqi territorial waters,” and had completed a ship inspection when they were accosted by the Iranian vessels. So now the US/British forces are not as strong as the Iranian Navy. This sounds like a BS story to me. Is this the 9/11-Golf of Tonkin incident that Bush and Blair will use to start “Debacle 2 Iran: The Sequel” Where they will get their asses kicked by an Army that is 4 times the size of Iraqs. At least Bush will continue to rake in the cash until he gets out of office. Something remarkable is going on in a Miami courtroom. The cruel methods US interrogators have used since September 11 to “break” prisoners are finally being put on trial. This was not supposed to happen. The Bush Administration’s plan was to put JosÃ© Padilla on trial for allegedly being part of a network linked to international terrorists. But Padilla’s lawyers are arguing that he is not fit to stand trial because he has been driven insane by the government. According to his lawyers and two mental health specialists who examined him, Padilla has been so shattered that he lacks the ability to assist in his own defense. He is convinced that his lawyers are “part of a continuing interrogation program” and sees his captors as protectors. In order to prove that “the extended torture visited upon Mr. Padilla has left him damaged,” his lawyers want to tell the court what happened during those years in the Navy brig. The prosecution strenuously objects, maintaining that “Padilla is competent,” that his treatment is irrelevant. Of course we chronicled all of this in The HL long ago. It would be nice if the mainstream media would get involved in this story so more people will be educated as to what our great country is doing to people some of which were rounded up so Bush could claim he was doing something about the “terrorist,” many of them of course have been released without charges after many years, but there are still many in Guantanamo who have not been tried and may be there forever. Torture by the US must stop for many reasons not the least of which is that if the “enemy” knows we are torturing suspects that will make it that much easier for them to do it to our soldiers if they were captured. Our reptuation around the world under Bush is bad enough as it is. A US Army unit that monitors thousands of websites and soldiers’ blogs has been served with a lawsuit by a San Francisco-based privacy group. In the suit filed in the US District Court in Washington last week, the EFF (Electronic Frontier Foundation) said that despite several requests for information from the Army unit, known as the Awrac (Army Web Risk Assessment Cell), no answers have been provided. Theresa, Having Bush and the Republicans around does make for some easy material. I ‘m perfectally willing to take my chances with the democrats. They do some pretty funny stuff too sometimes, plus we still have 2 more years of Bush. You know the Dems won’t impeach him IF They win. Until now, no U.S. official in any administration has ever advocated the testing of nuclear weapons by another country, even by allies such as the United Kingdom and France. One of these officials may have been Rice herself, Kessler hints. Rice, he reports, “has come close to saying the test was a net plus for the United States.” Rice has been trying to counter the prevailing view that the test was a failure of the Bush administration’s policy. A factual timeline of the North Korean program traces how policies of containment and engagement slowed and stopped the program, while threats of regime change increased the dangers. The two key failures were the choice to focus on overthrowing the government in Pyongyang rather than stopping the nuclear program, and the invasion of Iraq which distracted U.S. attention from the real nuclear dangers and propelled both North Korea and Iran to accelerate their programs. The revelation that some officials secretly wanted North Korea to test their nuclear weapons is evidence of how the administration’s national security policy has become completely divorced from reality.